If you want to get yourself or your team totally up to speed on F2P game design, and ready to face the challenges of 2016, a day spent at a GAMESbrief Masterclass is the best investment you can make. Masterclasses are in-depth, intensive courses with small class sizes and lots of practical, hands-on workshops where you’ll learn how to implement effective, sustainable F2P design in real game projects. GAMESbrief will run two Masterclass sessions in early 2016 – the first is in London on February 26th, and the second in San Francisco, just ahead of GDC 2016 on March 13th. Places at both classes are strictly limited (we think the Masterclass works best with small class sizes); the London class, in particular, is already close to selling out and only has six tickets remaining, so if you’d like to attend you should book as soon as possible. Alumni of the GAMESbrief Masterclasses include some of the world’s most famous and successful game companies. 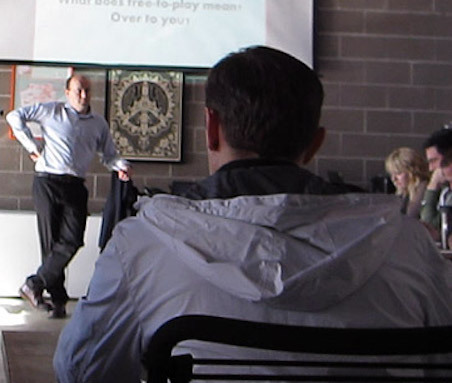 This isn’t a class full of underhanded tactics or “secret tricks” to fool players into paying up; we believe that good F2P cultivates a sustainable, respectful relationship with players who keep coming back because they love what you do, and GAMESbrief Masterclass attendees walk away with the tools and the know-how to do just that. Click here for more information and booking options for the London Masterclass on February 26th, or alternatively, click here for details and tickets for the San Francisco Masterclass on March 13th.